There is something amazingly pleasurable about watching Japanese food being cooked well. Even a street vendor in Osaka making okonomiyaki will demonstrate a care that makes it seem like the perfect blend of science and art. Here in the East Village's fairly new Dokodemo, three stations are setup for different foods that allow customers to appreciate this care, and makes the place all the more enjoyable for a meal. Three communal tables for dining in make the restaurant very casual and friendly, so while takeout is an option that seems popular, we recommend sitting down after placing the order at the counter and taking in the atmosphere. The origins of the three main dishes served here all trace themselves to simple preparations either at home or from street stalls. The most highly regarded vendors, especially in Osaka for takoyaki and okonomiyaki, require some very long lines before procuring the treasure. 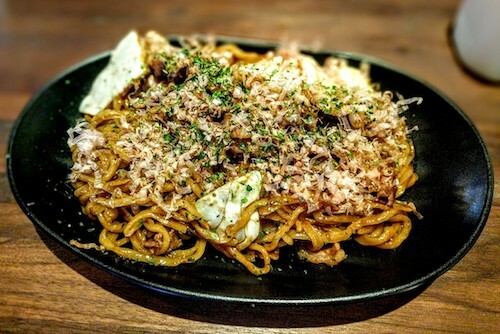 The East Village used to have a streetside vendor of takoyaki on 9th Street, but the best place to grab them now is probably here at Dokodemo. 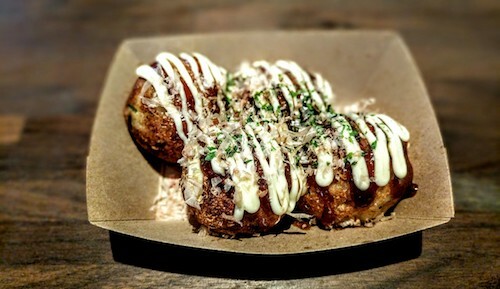 Served in portions of 4 or 8, takoyaki ($5.75 for 4, below) are balls full of wheat flour batter, octopus, onions, and cabbage. The thin crispy shell is easy to puncture and the perfectly cooked interior comes oozing out immediately. Ample portions of Japanese mayo are essential for the right flavor profile. On the board, these are called "Japanese calamari"
Ever since I sat down in Osaka at a make-your-own okonomiyaki restaurant, I have been obsessed with the dish and was very excited to first see a place semi-specializing in it. After that first one 12 years ago, I forced my friends to wait in those long lines for the most famous vendors and ate so much it practically came out my ears. There are two styles of okonomiyaki, this Osaka version, and a layered non-mixed style famous in Hiroshima. The Osaka style is more widely known and what they offer at Dokodemo ($9.50, below). These "pancakes" became popular during World War II when homes did not have access to normal amounts of rice. There are five "toppings" offered with the most common being pork or beef. Cabbage and batter are mixed with the selection and fried on both sides. 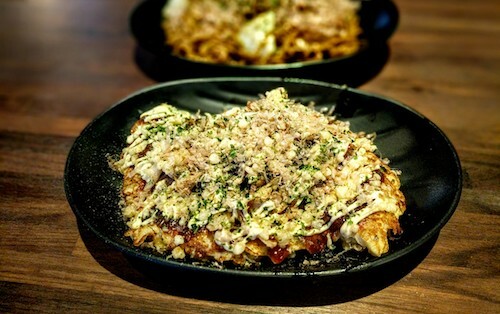 Okonomiyaki has its own special sweet sauce and is topped with Japanese mayo as well. Aonori and katsuobushi (seaweed and bonito flakes), as well as pickled ginger are sprinkled on top of everything. Yakisoba ($9.75, below) rounds out the menu here, a stir-fried noodle dish not actually made with soba noodles as the name might suggest. This dish also has its own sauce, and can come with one of four proteins. It would be easy to make this too salty, but their perfectly portioned (they measure) ingredients give you just the right balance every time. It is actually hard to say which item would be more recommended here, so grab a partner and get all three dishes for the best experience. A selection of small vegetable sides are also available for larger (or hungrier) groups.